Another exciting edition of Daizy's Mobile Home Renovation, now showing every Saturday...forever. Ok, not forever. It just feels like it. 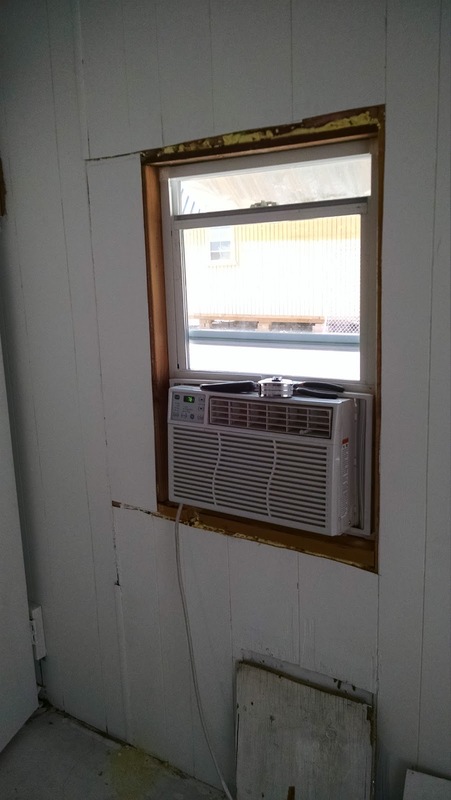 Good news, the A/C fits in the new window. This is much better than putting the A/C in the horizontal sliding windows and trying to block off the opening above, especially when it is windy or raining or both. Someday, I will put trim around it. I bought the trim and it is on the floor in the bedroom. 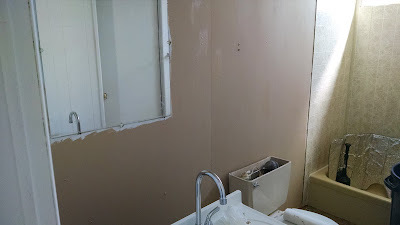 My niece painted the bathroom wall brown. I had extra paint in the shed that I wanted to use up. I like it better than the wallpaper. I suggested we try to use up another darker brown and make a sort of faux leather look but it just looked like brown poop on the wall. Not pretty at all. I spent a little bit of time out in the heat with the shovel and pick ax, trying to level out the fence panel. 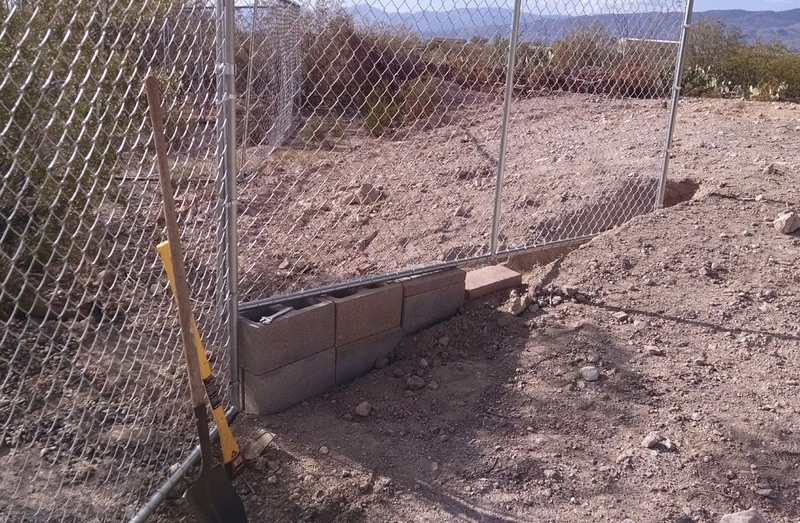 I decided to put blocks under it instead of digging down any more. It still needs work. I have also changed my plan for the fence. Because I haven't finished burying the earth anchors for the barn shed which I need to do in order to get my inspection and pay $650 (ouch), I am going to make the yard a little smaller for now. I will buy cheaper cattle panels to fill in the gap instead of connecting the fence to the barn shed because the inspector needs room to get his equipment in there for the pull test. 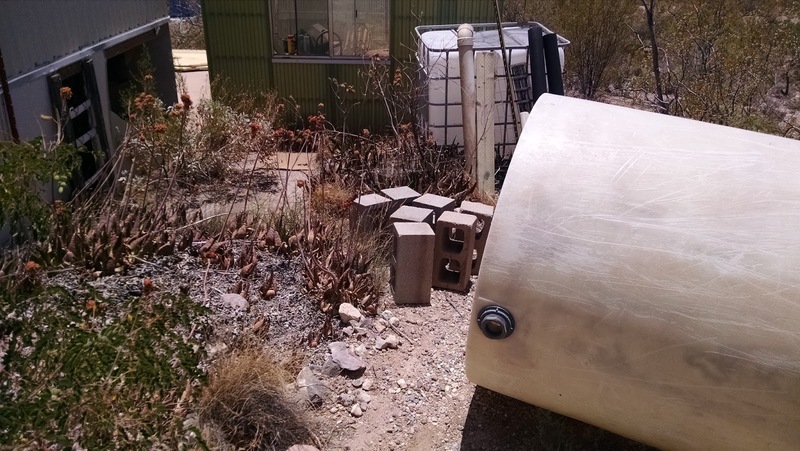 My niece and I rolled the 500 gallon water tank up and around the mobile home. I need to clear out the weeds and old piece of plywood to the left of the tank, then stand it up and connect the tank to the water pump. One tiny step closer to getting water to the bathroom. We added more bungee cords to the pool tarp. The wind was not cooperating and the bungees were only doing a so-so job. I hope the tarp is keep the evaporation to a minimum. We saw a snake snuggled up to the pool. I think it was a gopher snake. I couldn't see its head but it didn't have a rattle. I went back for a photo but the snake had left. And that was my exciting weekend. My chore this week: Buy pipe and fittings for the water tank to pump. So when this is all finished (if these things are ever finished) you and your nephew live out here. And then you can rent out the other house? Which must bring your mortgage finish date a lot closer? Well...I think by the time I am "finished" my nephew will be in college, but, yes, the ultimate plan is for me to live out there and rent or sell the house.